Premier Elk River, Missouri Canoeing & Kayaking Float Trips! 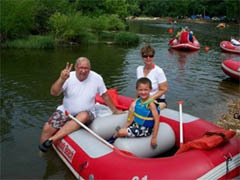 Shady Beach Floats is your source for the finest canoeing, kayaking and rafting on the Elk River in Missouri. An afternoon float down the Elk River in Missouri is an incomparable experience. Rated a class I-II, the Elk River is ideal for both beginners and more experienced floaters looking for a laid-back day. The gorgeous, bedrock stream of the Elk River, which runs through southwestern Missouri offers “rest stop” opportunities during you canoeing, kayaking or rafting trip on its many gravel bars. Enjoy a refreshing dip or just get your feet wet in the clean, clear water, which is kept cool year-round by several natural springs. However you spend your day float, Missouri’s Elk River will provide beautiful, natural surroundings that include high, forested cliffs and lush foliage growing down to the water’s edge. Bring your camera! Shady Beach Floats offers modern, well-maintained canoes, kayaks and rafts to accommodate your float trip down the Elk River in southwest Missouri. We offer both plastic and aluminum canoes. Each is designed for two people and, though a third person may ride in the middle of the canoe on the floor, we do recommend two people per canoe. Cast a line during your float trip for a fine fishing experience on the Elk River in southwest Missouri. The best time to hook the prolific small-mouth bass is in late winter/early spring and is available year-round. We recommend jigs and plastic worms as bait while fishing for smallmouth bass. 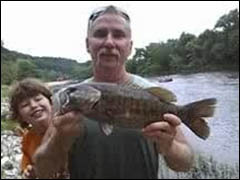 The Elk River is one of the highest rated smallmouth bass fishing spots in southwest Missouri. Other fish species include large-mouth bass, crappie, catfish and several types of panfish. 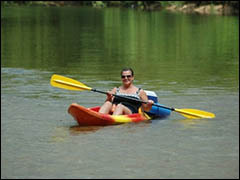 Choose Shady Beach for a Memorable Canoeing & Kayaking Experience on the Elk River in Missouri!